Step out in this navy blue short wedding-guest dress with a beautiful floral print. The sweet party dress features a halter bodice with a deep v-neckline and straps that tie into a feminine bow in back. A pleated waist provides a slimming look as it wraps around the midriff of the lovely blue party dress. The fully-lined semi-formal dress has a short skirt with crisp pleats that flow down to the hemline. 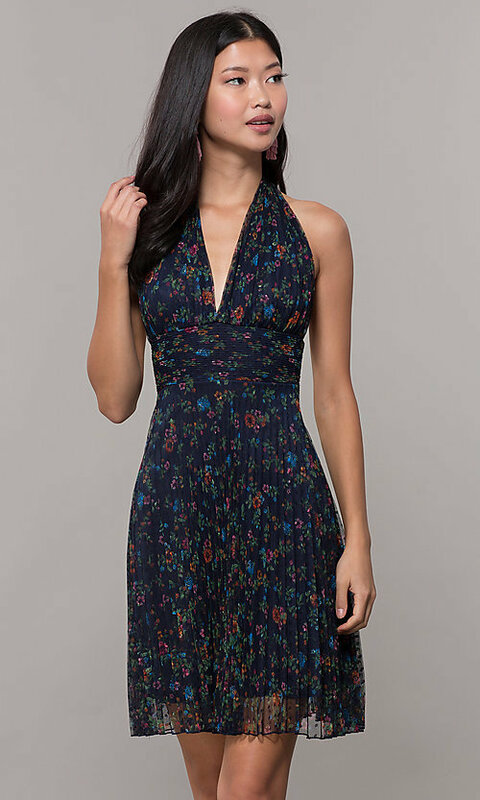 Affordably priced under $100, this short floral-print wedding-guest dress in navy blue is ideal for receptions, cocktail parties, and family celebrations.